Target heart zone : Programmable heart rate training zone with audible out-of-zone alert. 50 lap memory : Provides lap time, split time, and average heart rate for each lap count. Data mode : Recalls timing/lap memory, total time in target zone and average heart rate for each saved lap/run. View button : Provides easy access to pulse and chronograph modes. Other functions : Time/date display with one alarm. Ergonomic chest transmitter : Provides increased comfort. Battery hatch on watch and chest strap : Easy battery replacement. Face Diameter : 45mm (1.8"). The Nike Triax c8 watch was built for fitness or competitive runners who want to improve the efficiency of their workouts. Target heart rate zone is programmable with an audible out-of-zone alert 50 lap memory provides lap time, split time and average heart rate for each lap count Data mode recalls timing/lap memory, total time in target zone and average heart rate for each saved lap/run View button accesses pulse and chrono modes "S"-shaped design curves around the wrist for improved comfort and an easy read. 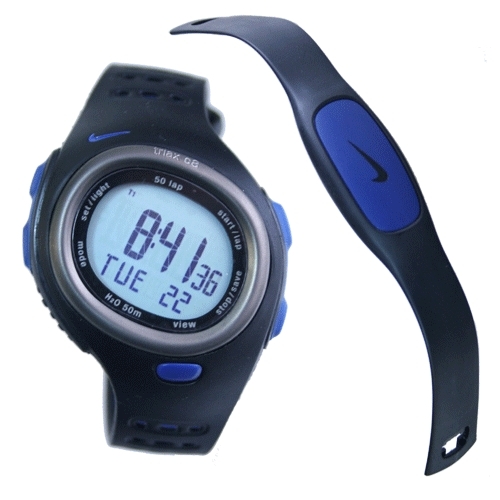 Ergonomic chest transmitter enhances comfort Nike Electrolite for one-touch backlighting Mineral glass crystal is scratch-resistant A battery hatch on watch and chest strap offers easy battery replacement Water-resistant to 50 meters. Whether you are a marathon runner, an avid jogger or a walker who walks merely for pleasure, you must know that the benefits of any kind of exercise can only be reaped if you are working out in your target heart rate zone. How does one make out whether you are in the right heart rate zone? It’s not a good idea to keep stopping and checking your pulse all the time! A better option is the Nike Triax C8 heart rate monitor watch which has a variety of functions to aid you in your exercise efforts. With this watch you can set your ideal heart rate and also program alerts which will warn you if you step outside the heart rate zone. The Nike Triax heart rate monitor also has great transmission capabilities and does not allow interference from any other device in the range. 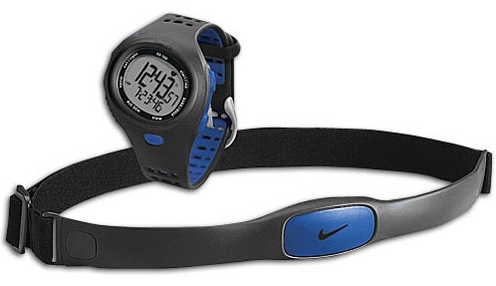 The Nike Triax C8 comes with a chest strap which can keep a tab on your heart rate. It has a 50 lap memory which can determine each lap’s statistics such as the lap time, split time, average pace, distance, and average heart rate as well. There are two interval timers which are for the various kinds of run/walk regimes and even the difficulty level of running/walking. The watch case and the strap have a great design which cab fit snugly around your wrist for a better reading. This watch is water resistant up to 165 feet and has an easy battery replacement feature as well. 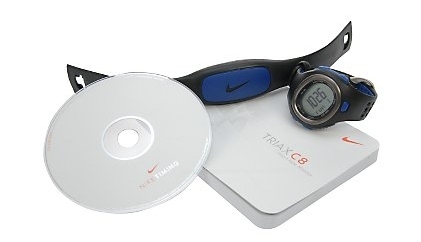 The Nike Triax C8 is a great way to get fit and stay fit. It’s easy to operate and does not require a tech savvy person. A normal layman can operate and understand it. The weight loss and the inch loss come later. The first thing that improves is the heart rate. You can monitor your body’s progress by monitoring your heart rate. The Nike Triax C8 includes everything a runner needs—no more, no less. With 50 lap memory, average heart rate, two interval timers, and a target heart rate zone, the Nike C8 delivers all of the essential running features. The View button provides quick access to all the key info, and the My View feature allows you to emphasize that data that’s important to you. 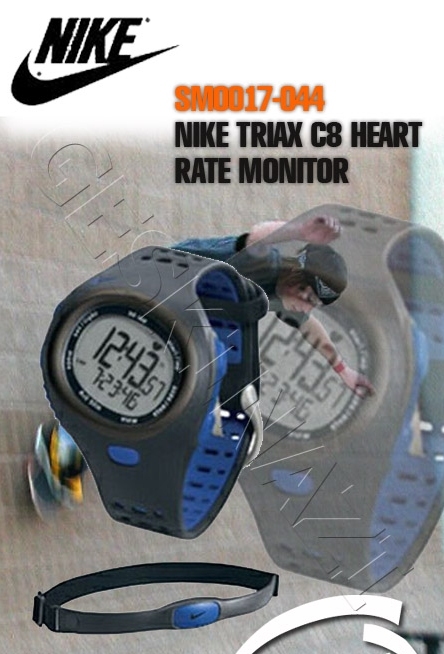 These fantastic Nike Triax Watches are ex-display / customer returns from one of the UK biggest high street retailers, and as such have some cosmetic marks on the packaging and some light signs of being demonstrated on the actual items, nothing that will detract from the normal use.